The Windsor Bridge Replacement Project, which is also referred to as 'Option 1', was developed by the Roads and Maritime Services (formerly the Roads and Traffic Authority). The Project was developed in response to the NSW Government's $65 million commitment to replace the existing Windsor Bridge over the Hawkesbury River at Windsor. Read the background here. 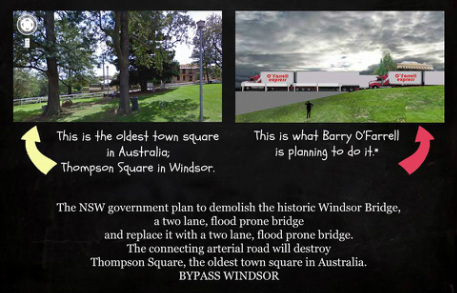 Option 1 involves the demolition of the existing Windsor Bridge and the construction of a high, modern bridge structure. The structure will be situated 35 metres downstream of the existing Windsor Bridge and includes a road approach through the historic Thompson Square. Other aspects of Option 1 include the replacement of the round about at George St/Bridge St with a set of traffic lights, and a round about built at the Freemans Reach Rd/Wilberforce Rd intersection. 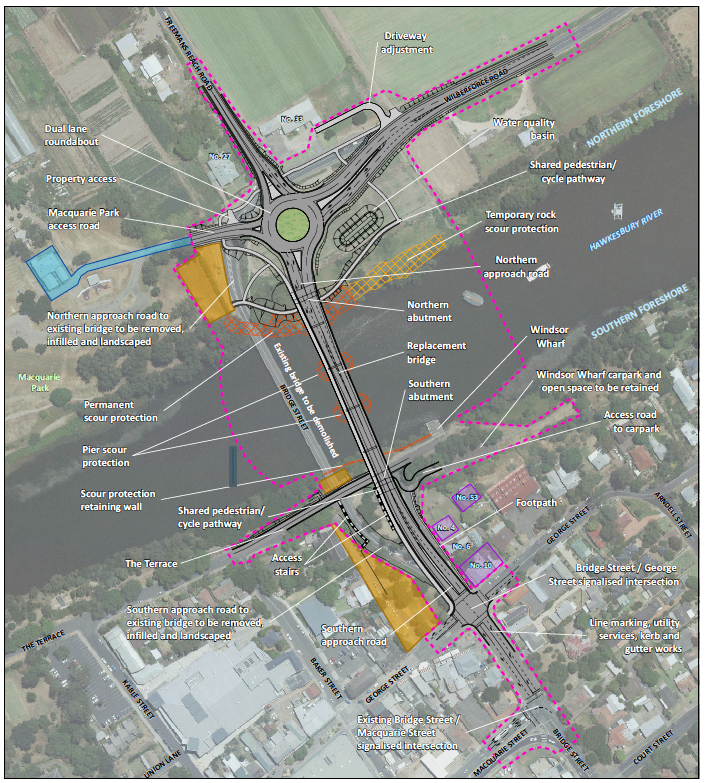 Option 1 will also see the introduction of several 'No Right Turn' traffic restrictions at the George St intersection, making entering the town difficult. The RMS has stated that by 2026 Option 1 will be close to travel demand capacity, resulting in traffic queuing and traffic unpredictability. The RMS has also stated that the proposed route may impact on the commercial operations of the retail precinct on George Street. The RMS has admitted that certain alternative river crossing options outperform Option 1 in a number of important areas and/or have less visual, physical and heritage impacts. Nevertheless, the RMS has chosen Option 1 as their preferred option. A recent report by Cambray Consulting states that Option 1 fails all project objectives apart from the cost/benefit ratio. i.e. it is cheap. Exerpt from Roads and Maritime Services (formerly Roads and Traffic Authority) presentation from the community workshop on 31 August 2011. Preliminary Urban Design and Heritage Review of Option 1, p 22. Option 1 will also see a reconfiguration of the parkland in the Square. Due to one of the project objectives being to open access to the riverfront, the grassed area will be excavated from George St down to The Terrace, resulting in a grassed area with a 1 in 4 slope (25% gradient), rather than the comparatively level area we have now. Plans for the parkland do not reflect the heritage values of the space. On 20 December, 2013, Minister for Planning and Infrastructure, Brad Hazzard, approved the Windsor Bridge Replacement Project. 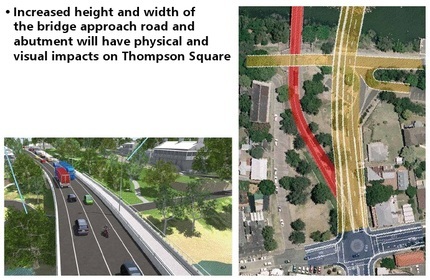 Watch an artist's impression of the approach road through Thompson Square here. Is this the future of Thompson Square? The Environmental Impact Statement (EIS) for Option 1 was on public exhibition until 17 December, 2012. The general submissions written in response to the EIS can be viewed here. Documents from the Department of Planning and Infrastructure, including independent reports, the recommendation from the Department and the Determination, can be read here.